When I have people ask me about getting started with animals, the first thing I turn to is chickens. 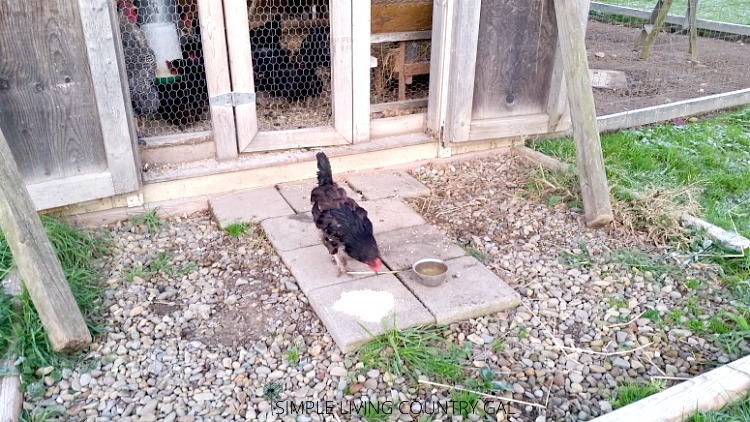 Chickens are a relatively easy way to test the livestock waters. They are pretty low maintenance, low startup costs and require little intervention. 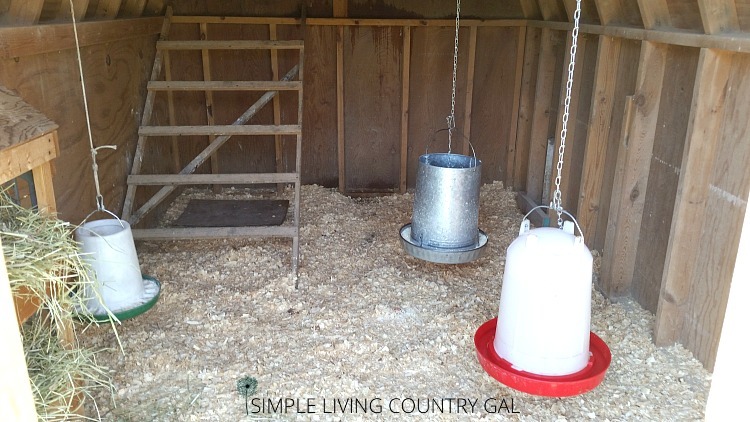 As long as you have clean water out at all times, fresh food daily and a clean and secure coop your chickens will be pretty self-sufficient. 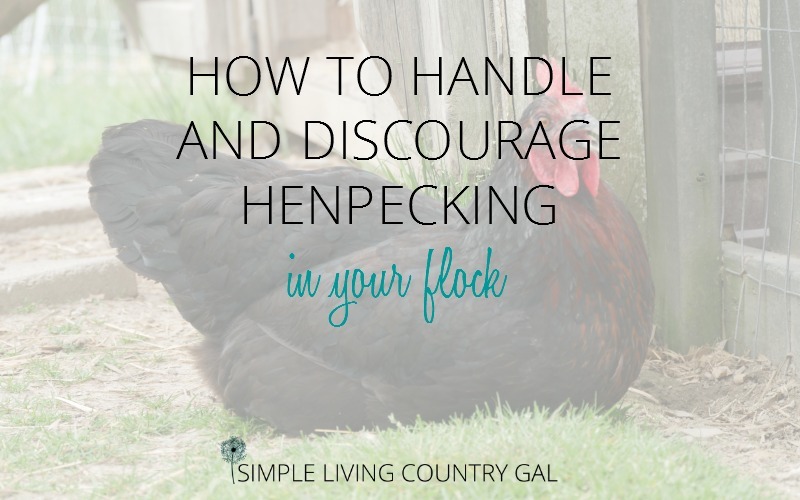 There are a few times however when we do have to step in and henpecking is one of those times. Henpecking or chicken bullying is something that does not happen in all coops. I have been raising chickens for close to 8 years now and have only had 2-3 instances to deal with. If you have issues with bully’s don’t think you need to get rid of hens right off the bat. There are a few things you can do to stop the bully’s and hopefully restore peace to your coop once again. Henpecking is when 1 or more hens gang up on another hen and peck or pluck her feathers out. There may or may not be blood and injury so catching things before they get out of hand is important. In our situation, I have a hen that is bullied and quite a few of her feathers are missing. There is no blood which is a very good sign. Blood can bring out the cannibalistic nature in chickens, once they get a taste they will continue to peck at that spot until someone (namely us) steps in to stop it. There are several factors that can cause other hens to bully onto one hen. These are some of the more common instances. If you are housing too many hens in too tight of a coop you will definitely have pecking issues. 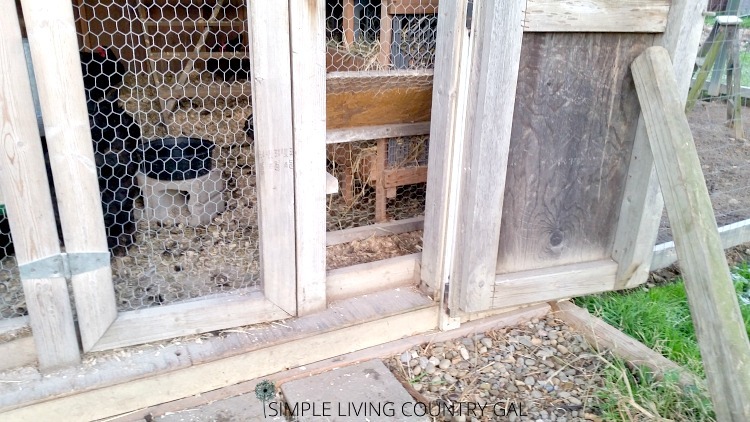 Chickens like to move around so you need to make sure you have ample room for them to do so. When building your coop, aim for 2-3 square feet per chicken inside and 8-10 square feet per chicken outside in the run. Have you ever heard the term “pecking order”? Well, it is definitely true and nothing shows it more than on a roost. 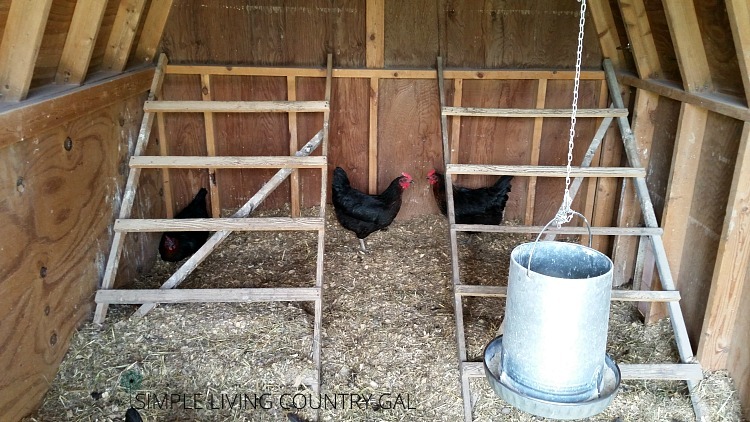 If you use a ladder as your roost, just go in after dark and look at how the hens are perched. More often than not you will have some on the top, a lot crowded in the middle and one or two at the very bottom. The ones at the top are your queen bees. That doesn’t mean they are your bullies, but you may want to mark them just in case they are. 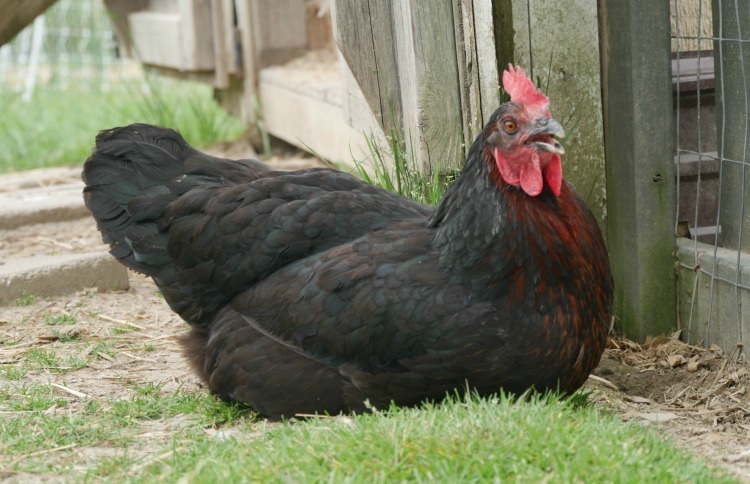 READ: Everything you need to know about chicken roosts. If you have more than a handful of hens then you will need more than one water/food option. I like to have 1 hanging food feeder for each 5-7 hens and at least 1 water source for every 10 hens. Since I also free range I will have at least 1 water option outside as well. More often than not, the hen pecking will happen at the feed bowl. If you have a chicken that is timid, weak, sick or injured she will more often than not be henpecked. For that reason, it is important to have a place to put sick or injured hens until they are healthy. This will really keep henpecking from starting in the first place. Chickens, once they do something, will do it over and over and over. Keeping bad habits from starting will save you quite a few headaches. READ: How to tell if you have a sick chicken. READ: What to do if you have a sick chicken. What can you do to stop hen pecking? There are a few things you can do to stop the bullies in your coop. Tip #1 Get your victim out. Before you do anything else, get that hen out of the coop. Having a safe place for your chicken to be while she recovers is super important. Hubs built me a little house that is part of the coop, we call this our chicken condo. 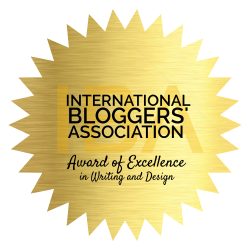 It is used more often than not and is so awesome! The hens feel like they are part of the flock yet they are safely away so they can recover. Yes, our condo is outside of our coop, but I have never had a hen leave the flock. Even though they are outside they will stay where the other hens are. So, unless you have a predator issue you can safely let your hen free range next to the coop and she should stay close by. If you do not have an option such as this, a small dog crate will work just fine. I would keep it inside the hen house (if you have room) at night so your hen feels she is with the flock, then during the day let her out so she can eat and scratch. Remember, she is not sick so you can safely do this. If she is sick as well, I would keep her away from the flock until you are sure she is healthy. Tip #2 Treat all wounds. Like I said before, chickens do have a cannibalistic nature. So your first step once you get the hen out is to treat any wounds or injuries she may have. Clean the infected area with warm soapy water and pat dry. If the wound is a bit deeper you can also flush the wounds with hydrogen peroxide, iodine, or betadine. You will need to check on her daily to make sure her wounds do not get infected. Tip #3 Support her health so she can more quickly recover. On our homestead, we like to do things as naturally as possible. 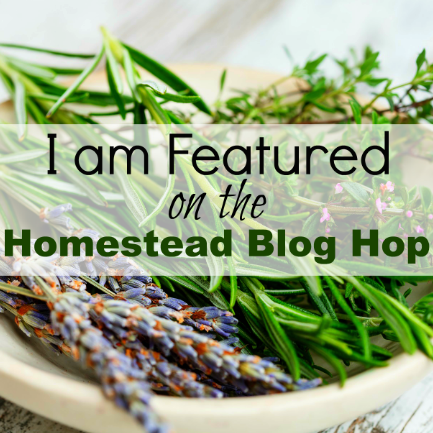 Kelp and apple cider vinegar(ACV) are two of my top items when I have a hen that needs help. Kelp is awesome for supporting the immune system as is ACV. Both are easy to get and the chickens love them. Simply sprinkle a little kelp on your chicken feed once or twice a week, you can also add a little ACV to your chicken’s water as well. 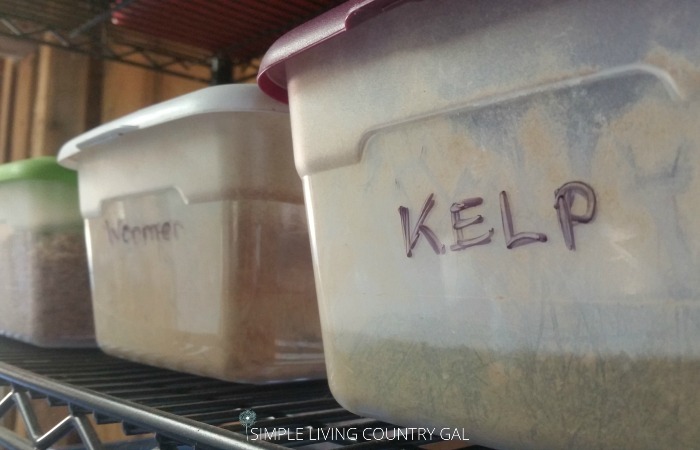 READ: Using kelp on the homestead for healthier chickens and goats. READ: Apple cider vinegar for healthier chickens. Tip #4 Keep them out until they are strong and healthy. I will keep my hen separate for at least 2 weeks until she is strong and healthy. It will take a while for her feathers to grow back, but my goal is her stamina. 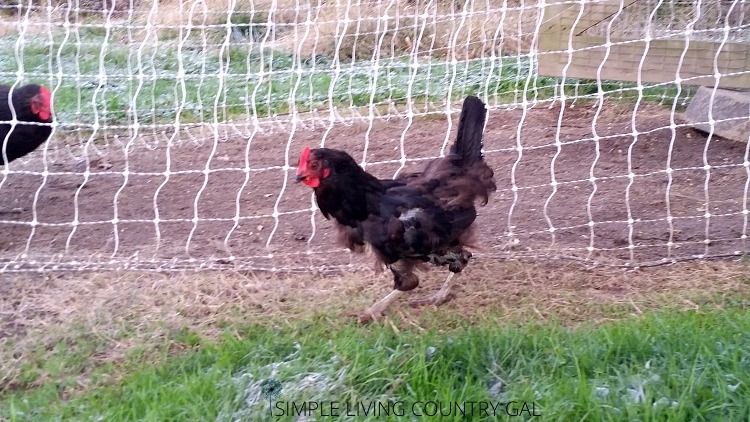 Remember bully hens will pick on weak or injured chickens so your goal is to make sure she is strong and healthy and better able to fend for herself. Tips #5 Keep an eye on her. When you are sure your hen is recovered, put her back into the flock but keep a close eye on her. Tip: if you think you may have a hard time remembering which one she is, tie a small piece of colored yarn to her leg first. If you see any issues of henpecking happening again you have some decisions to make. Tip #5 Cull your flock. Not my favorite option but one that is required if you want a healthy flock. Cull simply means to remove and you have a few options for this. You can 1. Pull the bully and sell (or butcher) her. 2. Pull the victim and sell (or butcher) her. Now I know your heart may say sell the bully, but a farmer told me a long time ago to keep the best and cull the rest. That means to keep the strong animals. This is not always a rule I follow, but I do keep it in mind when making these decisions. Tip #6 Identify the bully. The easiest way to do this is to catch the bully in the act. More often than not it will happen in 1-2 places. At the feed bowl or on the roost. When you are out feeding your chickens keep a watch on your feed bowls and see if there is any pecking or squawking happening. Keep watching over the next few feedings to see if it keeps occurring or escalates. Make a note of the troublemakers and the weaker hens when this happens. If you are not sure you will remember, simply tie a piece of colored yarn to the hen’s ankle. After dark take a flashlight and go into your coop. Check out your roost, I would bet that your hen-pecked hen is on the bottom or lower rungs. So, you may just find your bully on the very top. If you have not tied a string to your bully’s leg you can do so now. Hens move very little in the dark so this is your best time to get a little undercover work done. Like I said before, I rarely have issues of henpecking in my flock. But each time I was able to get the hen out and give her a safe place to stay while she healed. In all but one instance, I was able to safely return the hen to the flock and no more issues came up after that. I did have one time, however, when the bully just kept right on bullying. I chose to remove the bully at that point and keep the victim and here’s why. I would rather keep the docile hen and have a rooster watch over my flock rather than keep bully hens to watch over themselves. Sometimes a bully hen can be a bully to humans too and if you collect eggs or have children that help in the coop, friendly hens are usually the better way to go. The problem with Leghorns is they are a small breed and do tend to get picked on quite often. When have bullying issues that are not resolving you may need to help the “little gals” out. Make sure you have obstacles in your run and coop that your chickens can hide around. This will just help the bullied girls find a safe place while the bullies have more time to get used to them. I only separate the hens that are getting bullied when blood is drawn. I would set up some obstacles (a pile of branches in the run or a few logs and that may help them learn to get along. If things do not get better, you may have to consider selling your bullies just to keep the peace. I tend to raise the same breed each time to help deter bulling a bit.